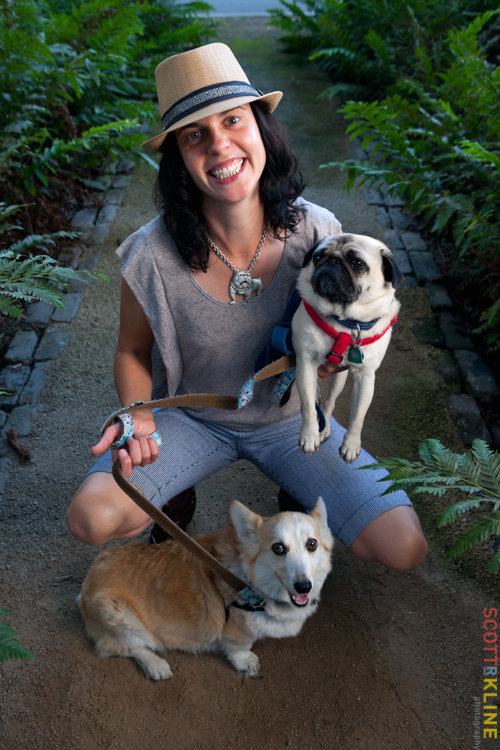 Jenn Lyons with Pete and Siggie photographed in Dogpatch near Espirit Park. 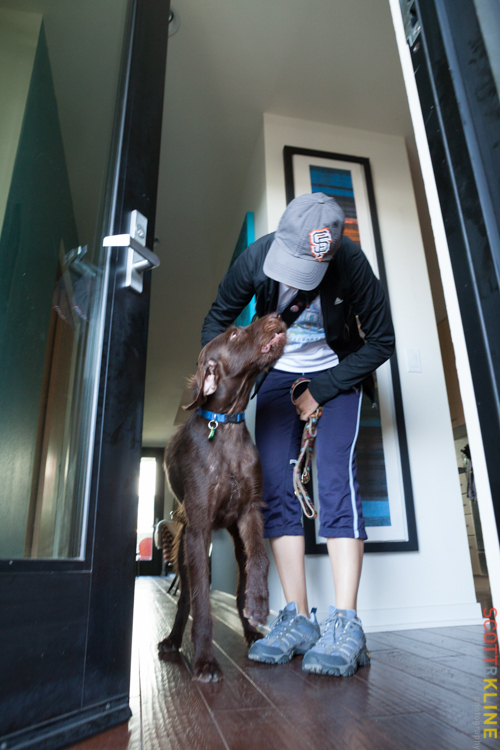 With an ever present baseball hat or visor clapped firmly on her head and an equally firm grip on numerous dog leashes -- the sight of dog walker Jenn Lyons coming down the street with her canine charges can bring a smile to even the most stoic city dweller. Even the tag line of Lyons' dog walking business sets the tone: Josi's Paw -- for friendly pets and people. 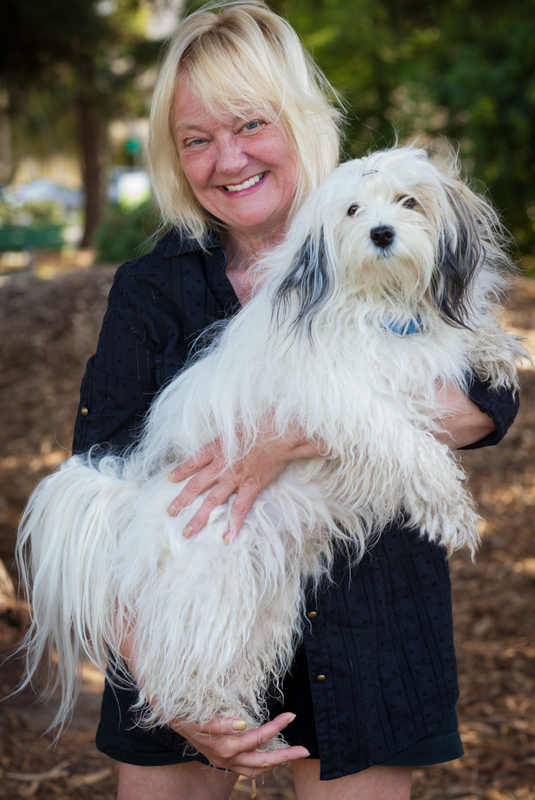 Josi's Paw is more than just a dog walking and pet sitting service though -- Lyons offers peace of mind to dog owners (sorry, caretakers) -- a reassurance that their faithful companion will not only be well exercised and cared for by Lyons, but also that Lyons will treat their dog as one of her own. Lyons granted us an interview during a rare break in her schedule. 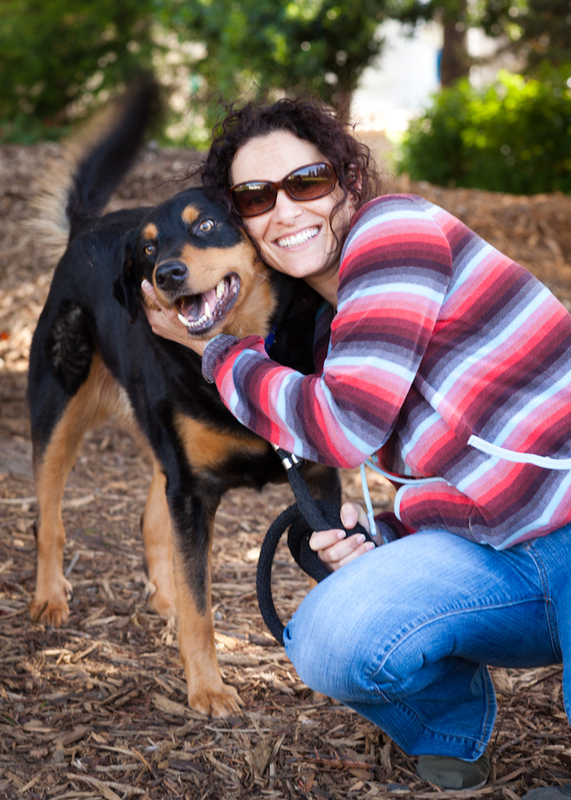 With her two dogs Pete and Siggie (age 6) by her side, we got to know more about this Dogpatch dog walker. Jenn takes her charges on a walk through Dogpatch. I guess it started with my love for a dog -- Josephine -- or as I called her, Josi. She died in 2006. She was my first dog as an adult and she was just the best dog. She made non-dog lovers into dog people. I made friends because she was so sweet and affectionate to everyone. She was my role model on how to be with people and with animals. I didn't really consider this as a profession until I moved from the Midwest to San Francisco in 2007. I actually worked in a retail pet shop when I moved here. I felt like I was searching for my next career after spending time in advertising and in the fashion industry. I knew I wasn't a desk job type person -- I need to be moving to feel happy. And I love being outside. And I love what I do. I treat each client's dog as if the dog were my dog. Even if they are complicated dogs! I'm their caretaker. That is important to my clients but equally important is that I keep their dog safe. All dogs are always on a leash. I'm also deeply aware that a client trusts me to enter their home and to take care of their loved one. So it is important to me that I'm the one actually taking care of the dog and being in their home. 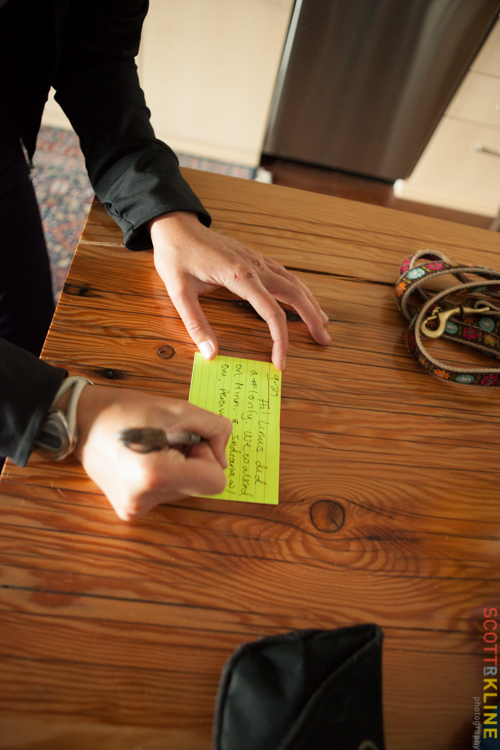 I also leave notes for each client describing how their dog did. I think it gives the client an extra bit of reassurance to hear about their dog's day! I also love to bring my clients together with their pets several times each year for dog parties! I actually have an event coming up Sunday, October 28 -- a Halloween dog party at Pawtrero Pet Shop. These parties are a lot of fun and are a good way to meet new people -- many of my clients have become my personal friends. 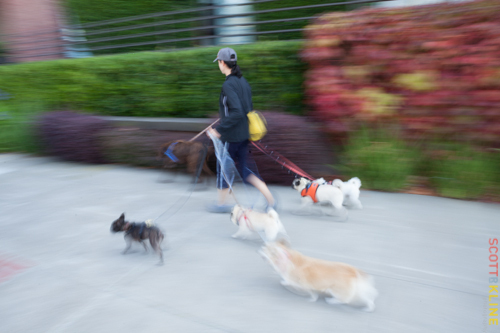 I grew up in the Midwest and my relatives still can't believe that dog walking is an actual profession! 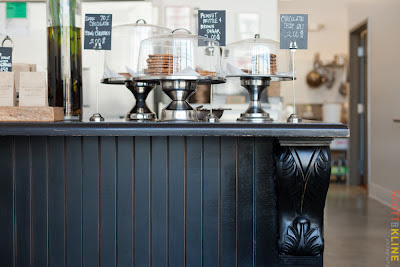 Most of my clients are in Dogpatch or Potrero Hill. I love how it is off the beaten path a bit and therefore not overly busy. 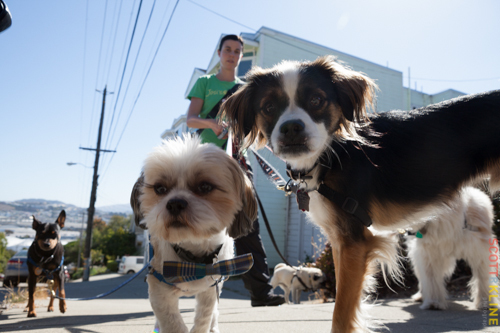 And because it isn't as busy as other SF neighborhoods, it is a safer place to walk dogs. My husband and I love the neighborhood so much we actually just bought a condo here. And of course I love the name of the neighborhood! Jenn gets a great view from 18th street toward the Bay. It takes lots of keys. I love walking by Ed McGary, he owns an auto detail business on Minnesota Street. He always has jazz music playing and is so friendly to me and to the dogs. He is charming and has a nice attitude about life. I was talking to Ian, one of the owners of Mr. and Mrs. Miscellaneous ice cream shop, and I admired his tattoos. He referred me to the tattoo artist that he had used. For my birthday I had an image of a hummingbird together with the Mandarin symbol for dog tattooed on my wrist. A hummingbird is my animal totem -- I'm inspired by their sweetness for life and how they live in the moment. I love how I can see the tattoo on my wrist as I walk the dogs. If I weren't doing this it would still have to involve dogs in some way! Perhaps a dog friendly wine bar since I love wine and food! Jenn's dogs are not shy for the camera. Linus says hello to start his walk. 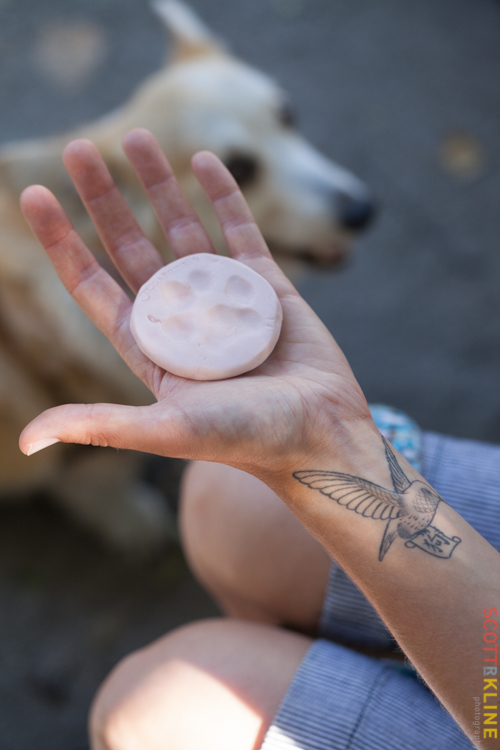 Jenn shows an imprint of Josie's paw and her hummingbird tattoo. Let's Make a Deal! Meet Craig Sakuma of Deal Décor! 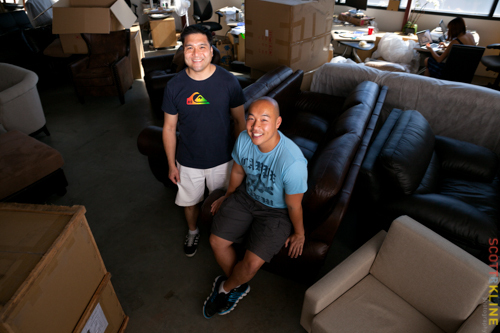 Craig Sakuma and Gregory Lok at the headquarters of Deal Décor in Dogpatch, San Francisco, CA. One of the many things we love about Dogpatch is the discoveries we find lurking behind the numerous nondescript warehouse doors that still dot the neighborhood. One stifling hot October day we found ourselves dodging the Veritable Vegetable trucks at Tennessee and Cesar Chavez to locate a newcomer to Dogpatch -- Deal Décor. We slipped in the door behind a young kid wearing both a San Francisco Giants hat and an Oakland Athletic jersey -- both teams had just won their divisions. The building directory was evidence that this particular warehouse was home to dozens of small businesses, including LightSource, Rebel8 and Acme Novelty Company but we were pretty confident that this diplomatic kid must be heading to the San Francisco Baseball Academy. Once inside we made our way to the offices of Deal Décor. We were greeted by founders Craig Sakuma and Gregory Lok as well as by Billy, the resident office dog owned by a neighboring business. The founders may have recently received $1.2 million in funding but their investors don't need to worry that it is being spent on posh office space -- their offices looked like someone had been bowling using furniture as the bowling pins -- sofas, chairs and other assorted furniture pieces were scattered throughout their office space. Deal Décor is all about using group-buying power to offer consumers a 30-70% savings on furniture and other home goods. The leverage of the group purchasing power allows them to cut out the expense of a middleman and ship directly to the buyer. We wondered if perhaps the founders were fans of journalist, Thomas Friedman and his book, The World is Flat, because that is essentially at the heart of how they look at the world. 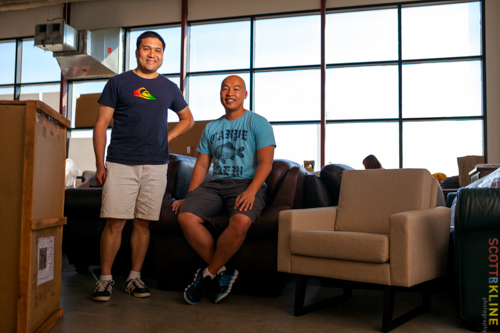 Deal Decor is using the Internet to flatten the traditional supply chain in buying furniture. And a supply chain doesn't come much more old-school than a furniture one. We took a few of those chairs to the less crowded and much cooler hallway to talk to Craig Sakuma about his new company. Both Greg and I worked for many years in the traditional home furnishings industry. As such we know the inner workings of the industry. We both worked a lot in Asia and have a lot of connections there. We saw the inefficiencies and we also knew that even though the consumer thought they were getting a unique piece of furniture, one factory in China actually makes the furniture for lots of brands. There was really no reason to be paying such a huge mark up for the furniture. I guess we saw an opportunity to create a whole new category in the furniture industry -- similar to how Frank & Oak is shaking up the menswear industry and how Warby Parker is offering an alternative way to buy prescription eyewear. We are all using the power of the Internet to flatten the supply chains for traditional consumer products, which in turn creates amazing deals for consumers. Once we have enough orders of our featured product to fill an ocean container, we have our factory build the product then we ship it direct to the consumer. We typically have three new pieces each week and each deal last ten days. We tested out our idea in California first. The enthusiastic consumer response convinced us we were ready to launch nation-wide, which we just did in September. Before we launched we actually had one consumer who lived out of state who so wanted to buy our featured product that they figured out a way to circumvent our ordering system! Of course we had to let them know we couldn't yet sell to them but we did let them know that we are now nation-wide! Until we found this space we had been working out of my apartment. But we now have five local employees as well as three based in China. We also needed a large space so we could photograph our samples. So it was time to start looking for a real office. We actually found this place on Craigslist! It has the industrial elevators and the high ceilings we need and the location is so convenient. One of our neighbors here is Sam Hoffman. He owns LightSource. It is a large-scale digital printing studio. They do such beautiful work. I'm so impressed with him and the work they do. I was working here late one Sunday night and all of a sudden I hear music. I go out in the hallway and there are party streamers everywhere and kids dancing. It looked like a middle school dance! Turns out the SF Baseball Academy were hosting a teenager's birthday party. Not something you see everyday in an office building! I would be looking for another start-up to run! I grew up on the East Coast and have lived and worked all over the U.S. and internationally. But San Francisco is unique in how friendly and supportive they are to entrepreneurs. I love the collaborative culture here. 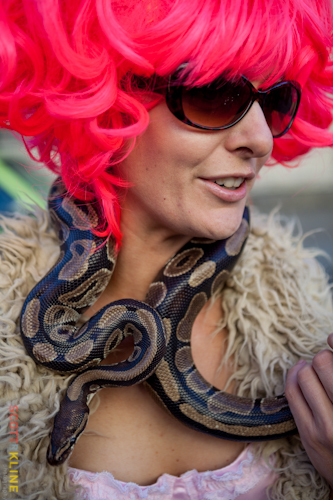 For the thirteenth year, Burning Man Decompression came to Dogpatch for its annual visit this past Sunday. The street fair closed down Indiana street between Mariposa and 22nd and took in Espirit Park as well. 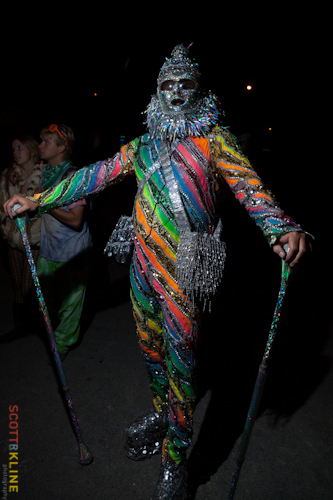 There was the usual food, fire dancers, rave music and art cars, but the best part in our opinion, is the people. 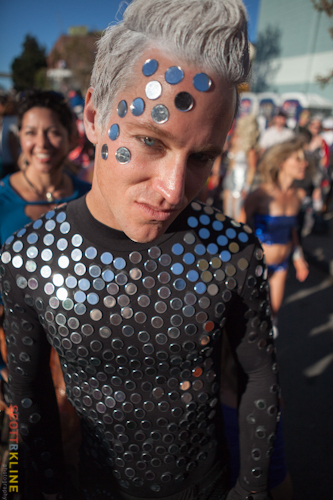 Burners come from all around to rekindle the magic for a day. 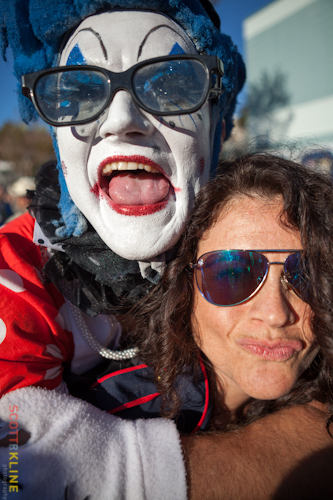 It can all seem a bit manic, but the people-watching is undeniably fun. We took the camera out several times during the day and these are some of our favorites. 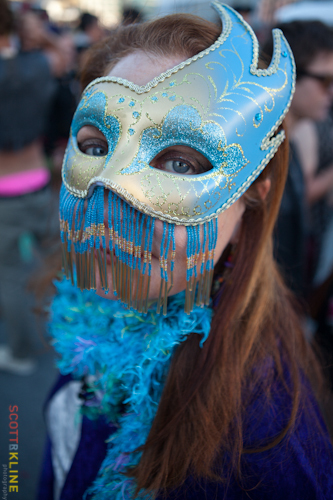 If self-expression is a San Francisco trademark, then it has no better counterpart than Burning Man. 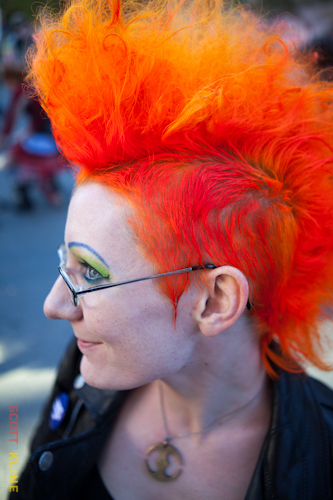 Photos by Scott R. Kline. Susan Eslick with collection of glazes used for her pottery. 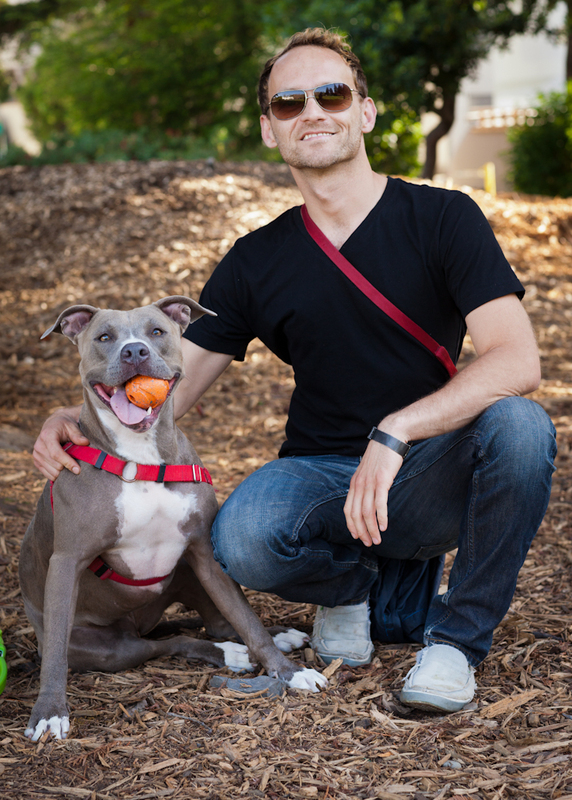 When we ask our indogpatch subjects to name another interesting Dogpatch person, there are two or three names that come up over and over again. Susan Eslick is on that short list. "Great storyteller, hilarious, successful artist and Dogpatch activist" are all words used to describe Eslick. So of course we had to meet this Dogpatch dynamo for ourselves. 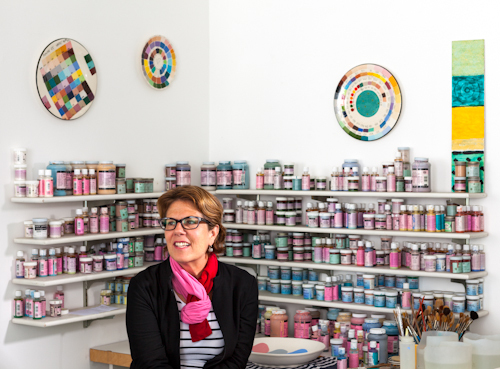 We met Eslick at her studio in the Noonan Building on Pier 70 in Dogpatch -- a haven for painters, photographers and other artists -- and she soon had us alternatively laughing at her stories and shaking our heads in disbelief at all she has accomplished as a neighborhood activist. Eslick has lived in San Francisco for more than 30 years but grew up in Buffalo, New York and studied printmaking and ceramics at Rhode Island School of Design in Providence, Rhode Island. She fell in love with San Francisco during an art program she attended at the Art Institute her Junior year and soon moved here after a completing a graduate program in printmaking at the School of the Art Institute of Chicago. Her creative business includes being a design consultant and creative director for a variety of clients as well as producing her own line of ceramic tableware and designing stationery items such as notebooks, journals and calendars for various clients. Her studio is bright and airy as you would expect an artist's studio to be but turns out it is also not where Eslick spends most of her time these days. Eslick continues to have a thriving design business but has an equally successful business helping other artists and creative types implement financial systems for their businesses. Implementing financial systems? Not a business typically thought of for artsy types. My tax accountant was always impressed at tax time when I would bring him accurate and complete financial statements for my design business. He joked that if I wanted to help other artists get their financial act together that he had quite a few clients he could immediately send my way. There is the stereotype of artists not being good with money but I was always determined to make a living by being an artist. And being an entrepreneur runs in my family -- my sister is an interior designer in SF and another sister owns a restaurant in Chicago. 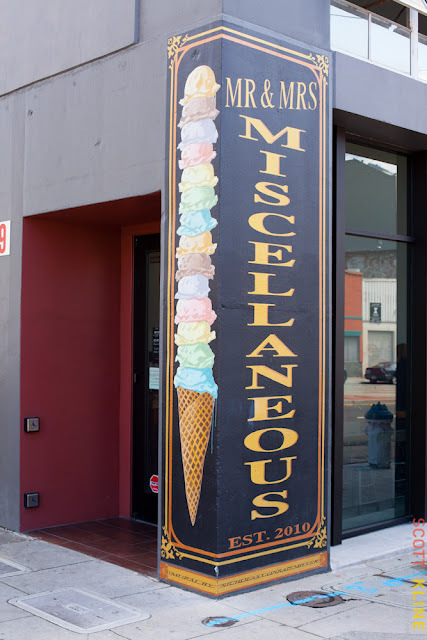 I guess you might say I was an artist in search of a business when I arrived in San Francisco. A partner and I started a commercial and residential ceramic tile business and got our big break when we were hired to create the tile for the first Apple Computer headquarters back when Apple was just getting started. I'm proud of the successful business I've built as an artist and designer but the design business has changed a lot in the last few years and I was ready for another challenge. I'm still an active designer and always will be but now I'm reinventing myself as someone who can help others make a living by doing their art. I went back to my tax accountant and said I was ready. I named my business (The Bookkeeper), designed my new cards and I was instantly busy! I've been in this new business for about two years and have more than 30 clients. It's all word-of-mouth -- I don't even have a website! And I love it. Many artists are self-employed and as such are alone most of the time. I like to think I do more than just financial systems for my clients -- I'm also a good sounding board for new ideas since I can relate to their creative process. My first business was in the American Industrial Center. I loved the hustle and bustle of the neighborhood during the day but loved how quiet it was on the weekends and evenings. I also loved the history of the neighborhood. So I eventually bought a house here. But in the late 1990s the character of Dogpatch was threatened by one inappropriate building project after another. I started the Dogpatch Neighborhood Association (DNA) to help protect the neighborhood from some of these projects such as the 300 bed homeless shelter that former Mayor Willie Brown wanted to put at 20th and Illinois. Just as there are today, there were a lot of creative people in Dogpatch so we all rallied to put together impressive press packets and suddenly we were all activists! We told the city that we would consider a 50 bed facility if every other neighborhood in SF would do the same. Willie Brown backed down. We then took on the immense project of having Dogpatch designated as an historic neighborhood by the SF Board of Supervisors. Thanks to the work of SF architect Christopher VerPlanck and his interest in San Francisco's nineteenth-century industrial architecture and workers' housing, Dogpatch resident John Borg and I were able to create a convincing dog-and-pony show to educate the board about Dogpatch. We argued that Dogpatch was one of the original Live/Work neighborhoods that were just then becoming all the rage in San Francisco as evidenced by the still standing Pelton Cottages -- inexpensive housing that was built to house waterfront workers. One of the requirements to become an historic district is to have an official survey of the neighborhood completed. It took four years but we raised more than $15,000 to get the survey completed and in 2002 the Board of Supervisors voted in favor of the historic neighborhood designation. 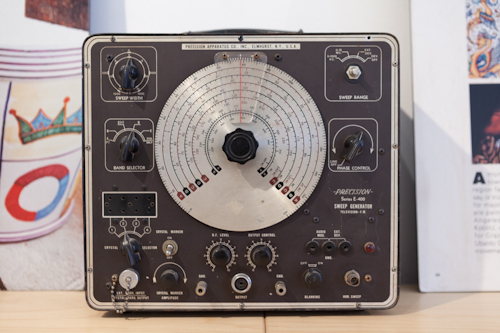 A vintage sweep generator adds interest to Susan Eslick's studio. Dennis Herrera, the SF city attorney, has been in the neighborhood for a long, long time. He has lots of stories about the "early" days and is a super approachable and nice guy. Also, boat builder Paul Zingaro and the owner of Persnickety Painters, Jared Doumani have been in Dogpatch a long time and have great stories. I guess I enjoy good storytellers! It was about nine years ago and my mom was visiting from New York. It was early in the morning and we were getting ready to take her to the airport. Mom kept saying how she was hearing lots of noise outside. We downplayed it since we live in an industrial neighborhood. We even heard a big BOOM like an explosion but we even dismissed that. Finally, someone starts to bang on our front door. It's my sister and behind her is a crowd of drug enforcement agents in riot gear as well as lots of news media. Turns out the police were conducting an early morning raid on the Hells Angels who have their headquarters on our street! The big boom was the door being blown off their headquarters. Of course my mom no longer wanted to go to the airport with all the excitement going on outside our front door. I'm doing what I want to do. I feel very satisfied with my work and with my role as Dogpatch booster! "The livery of freedom." That's what Mahatma Gandhi called khadi. Khadi means cotton and it is used to make hand-spun and hand-woven cloth. At the time of India's struggle for independence, Gandhi urged the people of India to wear Khadi garments to show the unity of India and the self-reliance of its people. But according to a recent article in The Economic Times (of India), the number of India's handloom weavers who create this type of cloth and others are on the decline due to low remuneration, rising costs and the loss of Government subsidies. 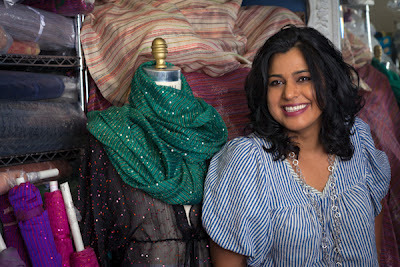 Smita Paul founded Indigo Handloom in 2003 as a response to what she saw as not only the dwindling of India's handloom fabric industry, but also of a way of life for its artisan weavers. Coupled with this mission of social justice is another lofty goal for Paul: make a difference in the fight against global warming -- handloom weavers use zero energy to create their colorful fabrics. In addition to Khadi, Indigo Handloom also offers Muga and Mutka Silk, Batik, Jamdani and Ikat. She markets these fabrics to small to mid-size designers and her own clothing line is in the works. 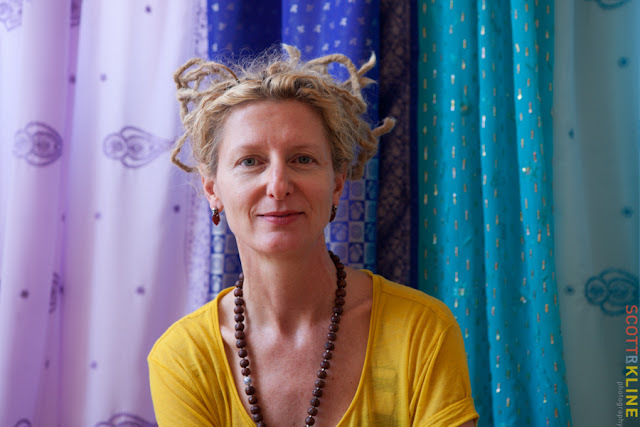 In addition, a selection of scarves made from these fabrics can be purchased from her website. 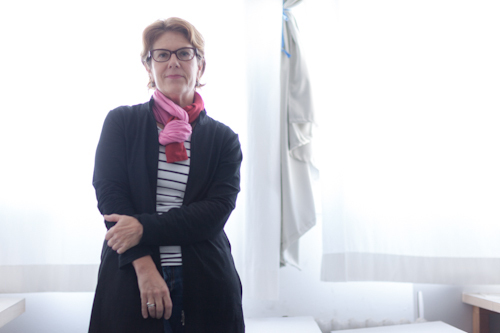 Intrigued by Paul's crusade and wondering how a former hard news journalist became obsessed with textiles, we met up with her at her small workshop located on the third floor of the American Industrial Building. Three clocks representing the time zones where Paul spends most of her time crisscrossing -- New York, San Francisco, and India -- were featured prominently on one wall and with Paul due to leave that day for a business trip to NYC, we knew which time zone her eyes would be keeping track of. 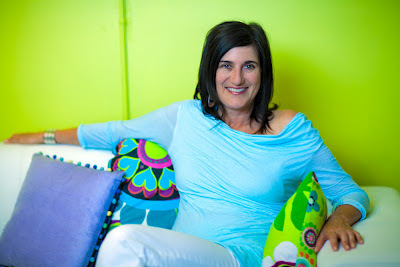 The small space has surrendered to Paul's love of color and textiles as the brick walls of her office flow into the blue hued walls and purple window frames. Hundreds of bolts of fabric in a riot of colors and numerous patterns were stacked neatly on shelves. A large, ornate mirror reflected it all and made us feel we were in a much bigger space. I can literally feel the presence of the weavers when I cut in to these beautiful fabrics that they have created. And I also feel for them -- the loss that they are experiencing of how they have lived and worked for generations as their numbers and their industry dwindles. And I guess I am humbled that they have so little in material possessions yet they create such beauty. I want to bring recognition to them to help them survive but I also want to bring their beautiful fabrics to the awareness of an audience outside of India. When people think of fabrics from India they think of bedspreads and perhaps of bad quality fabric. 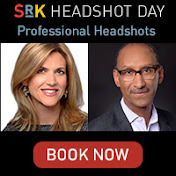 This is the opposite of what I experienced as an Indian-American girl growing up in Tennessee. The fabrics and garments I saw the women wear were high quality, sophisticated and beautiful. I wanted to show that sophisticated side of these fabrics to the world. I knew I could help by taking these fabrics the weavers make and change the style to make it more modern, more fashion forward in order to create a larger market for them. For most of my working life I was a journalist for newspapers and magazines as well as a journalism instructor at Columbia. I worked for high profile media companies also as a freelance journalist. I really did have the dream job as a freelancer -- I pitched stories that I wanted to cover in places that I wanted to travel to. It was on a trip to India to cover a story that I first learned about the handloom industry. I've always enjoyed sewing and loved textiles so no matter where I was traveling to for a story I would make a point of finding local fabrics. I was just amazed by these beautiful fabrics that were literally made by a poor, landless weaver living in a mud hut! And when I realized that these weavers use no energy, not even a light bulb to create their fabrics, I knew I had to be a part of this story. I realized that I could help create fabulous clothing with a very low carbon footprint. In fact the recent wide-scale blackout in India had zero affect on our production -- zero! I knew nothing about design or how to run a retail or wholesale business but I'm proud of how much I have learned and accomplished -- Eileen Fisher is one of our biggest customers -- and I'm excited about a potential new clothing line that I'm working on. Dogpatch reminds me of my favorite neighborhood in New York, Dumbo, where I lived and I first started my business. Dumbo is also near the water and it has the same great creative energy. Well, it feels like I work all the time but no one works harder than Gilberth and Julia Cab! They own several restaurants in Dogpatch and I so admire what they have created. Honestly I think I would still be a journalist but a bitter one! One of the reasons I turned my back on journalism was because I felt that there is such a manipulation of the media these days. I really felt like I couldn't make a difference in the world by being a journalist. I don't feel that way now. Dave Gifford and Kevin Doucet with some of their wine. Many months had passed since we had heard rumblings that Dogpatch WineWorks would be opening soon to the public in its location off of busy Third Street. So we were happy to see the small sign on the sidewalk proclaiming that the tasting room was open and the door to this urban winery now open to the public. 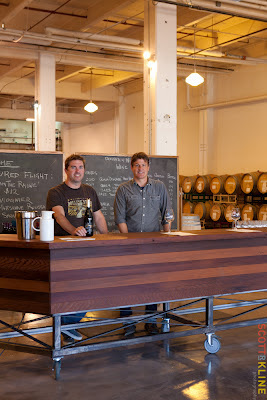 There had been a lot of disappointed city dwellers when one of the original urban wineries, Crushpad Winery, had moved out of Dogpatch to Sonoma a few years ago. 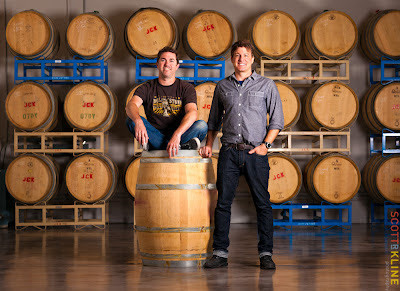 But one former Crushpad employee, Dave Gifford, and a Crushpad client and investor, Kevin Doucet, still believed that there was a place for an urban winery that could offer a hands-on, personal approach to individuals who wanted to create their own wine and in 2010 they joined forces to open Dogpatch WineWorks. Gifford and Doucet have created a welcoming space out of a large space formerly occupied by a locksmith company. The space is a blend of traditional winery furnishings and fixtures that have been given an urban makeover; the tasting room bar is a reclaimed vintage wine tank that has a city feel to it with its large stainless steel wheels. 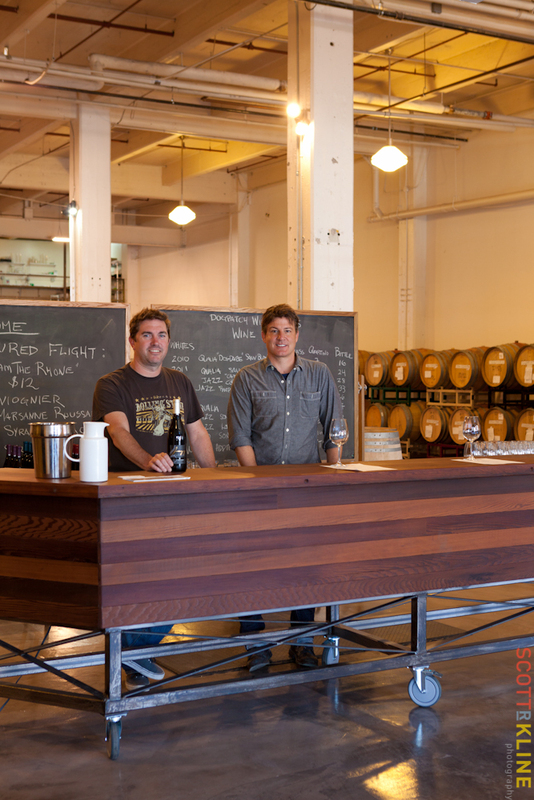 We sat down with the co-founders in a cozy corner of the tasting room to talk about their vision for Dogpatch WineWorks. Dave Gifford: Making wine is fun. My background is in the culinary world. But even though I was on the management side, I always found myself either in the kitchen or behind the bar. I liked to get down in the trenches and get my hands dirty more than I liked being the front of the house. I liked orchestrating all the various moving parts of a restaurant to get everything working in harmony. When I started getting interested in the wine business I found many similarities -- especially in working the wine harvest -- you get your hands dirty and there are a lot of details to pay attention to so that you have a great finished product. And it is the only job I have had where both your mind and your body get a workout. Every day I would be exhausted but would come home with a big grin on my face! Kevin Doucet: I come to winemaking from the investment banking side. But after more than 14 years in that world I wanted to try something different. I tried lots of things -- traveled, went to culinary school, studied wine making and worked in the wine industry in Argentina and Australia. I loved everything about the wine business. 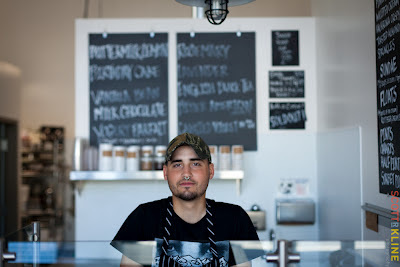 I met Dave at Crushpad in 2008 where I was working as a harvest intern. We are a production winery first and foremost that is dedicated to helping wine enthusiasts be successful. We are the only custom wine maker in San Francisco. We think the WineWorks part of our name says it all -- we are a lab or even an incubator -- anything you need to help you realize your dream of making wine. A customer can be involved from picking the grapes, to blending to bottling. So we are primarily a production winery but we also see an opportunity to offer the wine we make to the public through our tasting room and to also offer our winery space to folks looking for a unique spot to hold special events. We looked at 30-40 potential spaces in San Francisco for our winery including the former Crushpad spot down the block from here. 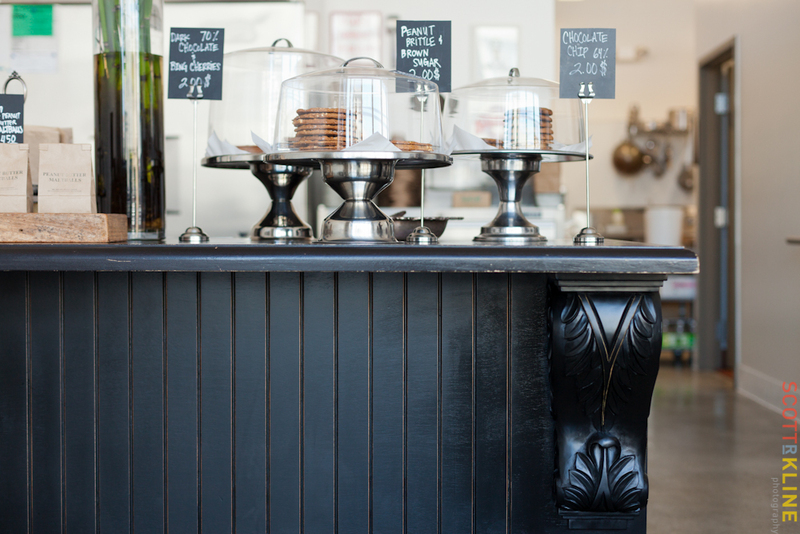 Since we had both been involved with Crushpad, we knew the Dogpatch neighborhood pretty well. We liked that Dogpatch was still a place where people made things -- that fit the vision we had for our winery. We liked the red brick of this space -- we felt we could renovate it to be the warm and inviting place that we envisioned. We like to see the faces of customer's light up as they walk in here from busy Third Street -- they don't expect to see a traditional winery in such an industrial neighborhood. We like the surprise of that. 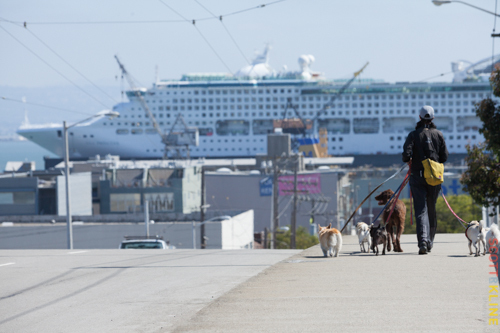 No other neighborhood in San Francisco offers the zoning flexibility of Dogpatch. The city knows that there is a lot of land that can be developed in this neighborhood and the city was very open to us creating a multi-use facility here. 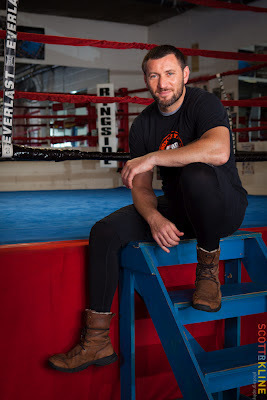 The owner of the American Industrial Center, Greg Markoulis, where we are located is a straight shooter and we worked with him to get the lease we needed. There are so many! Shy at Reno's Liquor Store always makes me laugh -- I always leave with a smile on my face. 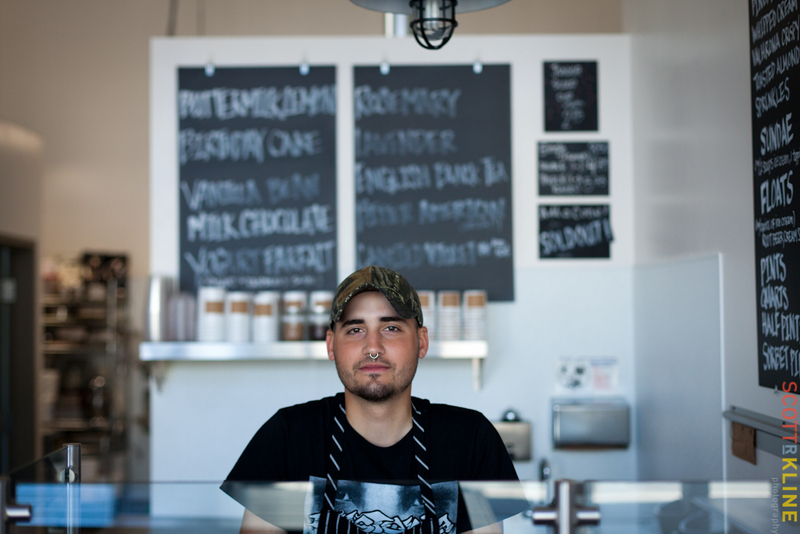 Olivier Cordier owns Olivier's Butchery nearby. It has been fascinating to watch him develop his business on Illinois Street, which doesn't exactly have a lot of customer traffic. He has a great product and he is great at promoting it. Tony Hua of Hard Knox Cafe and Julia and Gilberth Cab who own three Dogpatch restaurants are three of the hardest workers I have met. Dave and Kevin greet visitors at their custom tasting bar. What is an interesting story that has happened to you since you opened in Dogpatch? A film school has its offices in this building. One day they were working on a production where they were using fake guns. Someone on the street saw them and called 911. The police, including a SWAT team, shut down our entire block and warned us not to come out of our offices. It turned out to be a false alarm but it was great to know that they police would come if needed them! KD: I would be making wine somewhere else if not here. DG: Everything I have done in my career has led me to winemaking. If I wasn't doing this I would certainly be miserable anywhere else. Christopher Webster welcomes a guest to his domain. The room appears in total darkness as we enter Hogan's Goat Tavern. 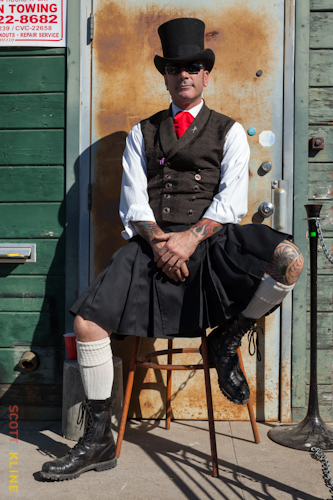 As our eyes adjust we see the dapper figure of owner Christopher Webster. The coolness of the room is a welcome relief from the heat and bright sunshine of the June morning. Now all we need is a cool drink to quench our thirst. And there is plenty of liquid to choose from here. Webster stocks the usual suspects of high-end spirits and beers but he also offers local spirit, beer and wine brands such as wine from SLO Down Wines, vermouth from Sutton Cellars and Anchor Steam beer from Anchor Brewing. But if your taste is more Budweiser than Anchor Steam, he has that as well. We take a seat at the glossy mahogany bar and decide to try one of the beers on tap. 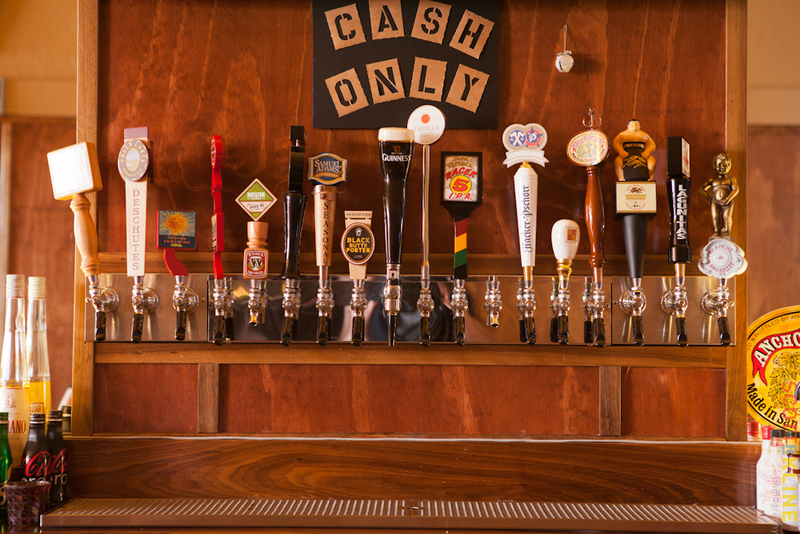 The taps may produce beer that has been created as an artistic expression of the brewmaster but the taps themselves appear as small pieces of art. One of the taps from producer Orange & Black is even signed by the brewmaster. It being a Giants Game Day, we order the Orange & Black as well as one red wine. 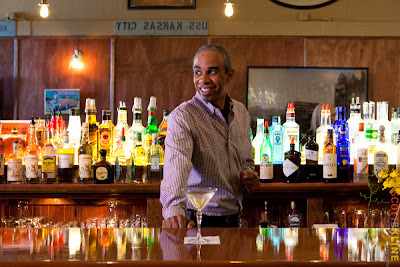 Webster appears to favor order and symmetry not only in his attire, but also in how his bar looks and how he serves his product. Each beer is served in a glass from the producer of the beer. Webster explains that he feels it is important to serve the beer how the head brewer envisioned it to be served. Except for the three flat screen TVs on mute and the pool table in the back of the room, the bar is sparse on furnishings. This leaves the focus on the spirits being consumed and if you desire, conversation with your fellow imbibers. The overall feel however is one of peace and quiet -- a good place to have a drink in peace. 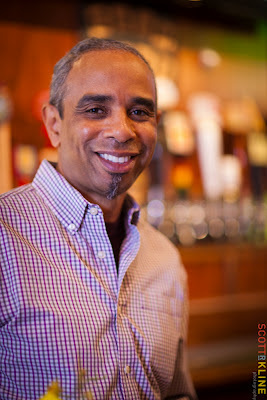 As Webster pulled our beer and slid it down the bar to us old style with a flick of his wrist and not a drop spilled, he agreed to swap roles and be the talker instead of the stereotypical listener the role that seems to befall most bartenders. It's fun! I have had a lot of serious jobs in the past and I still work as an investigator for insurance companies. In that work I primarily gather facts about people and what they did or did not do. As a break from the investigator business I started bartending on the weekends at The Double Play Sports Bar. Long time bartender Jimmy Calonico took me on as an apprentice and taught me a lot. Eventually I decided I needed to get an official certification in bartending. From there I moved to the Dogpatch Saloon and finally to buying and completely renovating the Sea Star Club in 2011 which became Hogan's Goat Tavern. This job is the opposite of my investigator work. Here I don't have to pry any thing out of people -- if customers want to tell me things about them that's fine. Or they can just be left alone and that is fine with me as well. 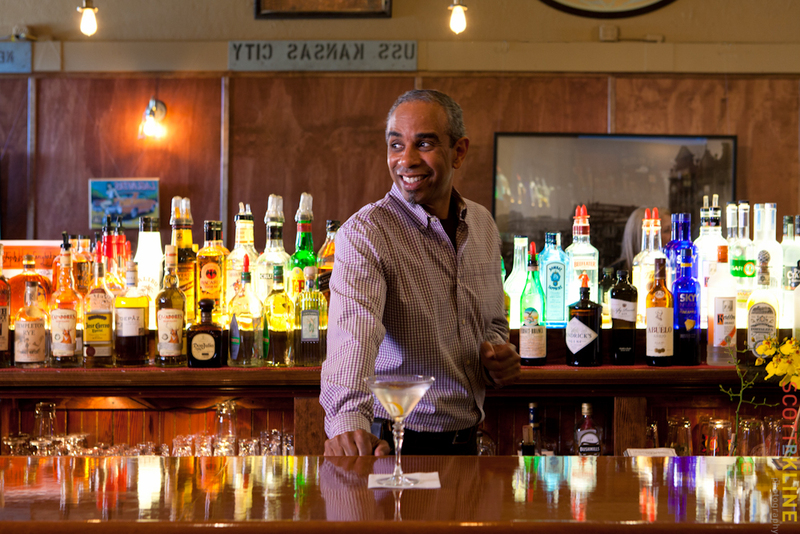 The best way to get a coveted liquor license in San Francisco is to buy from a business that already has the license. When the Sea Star became available I was interested in it because of its existing liquor license. I also already knew many potential customers here from my bartending work at The Double Play and the Dogpatch Saloon. I also liked how Dogpatch is so easily accessible to people coming from the Peninsula or from other parts of San Francisco. 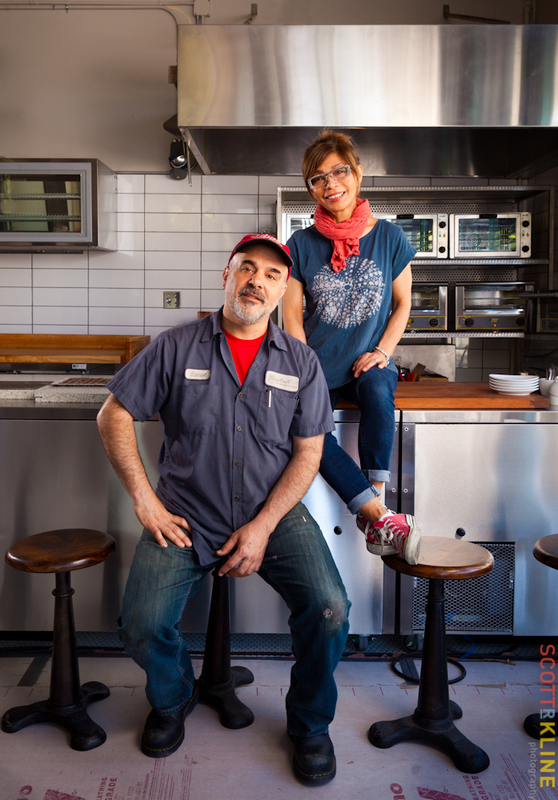 Julia and Gilberth Cab are the owners of three Dogpatch restaurants and probably the hardest workers I know. I think they actually work EIGHT days a week. What is an interesting Dogpatch story that has happened to you in Dogpatch? It's not a story that has actually happened to me but one of my customers is the librarian at San Quentin prison. He has some very amazing stories about what it is like to work there. What would you be doing if you weren't pouring drinks and letting customers bend your ear? I love this work -- this is what I want to be doing every day. And finally, why did you name the bar Hogan's Goat Tavern? It is an old expression and the favorite saying of the father of my partner. You can find several different meanings of the expression but the one he used all the time was, "you are as f***ed up as a Hogan's Goat. We thought it would be a fitting name for a bar. Bibby Gignilliat in the colorful digs at Parties that Cook. The nondescript office building on Minnesota Street gives little indication of the vibrancy within its double doors. The bright colors of purple and green greet us as we walk up the stairs to meet Bibby Gignilliat, founder and CEO of Parties that Cook. 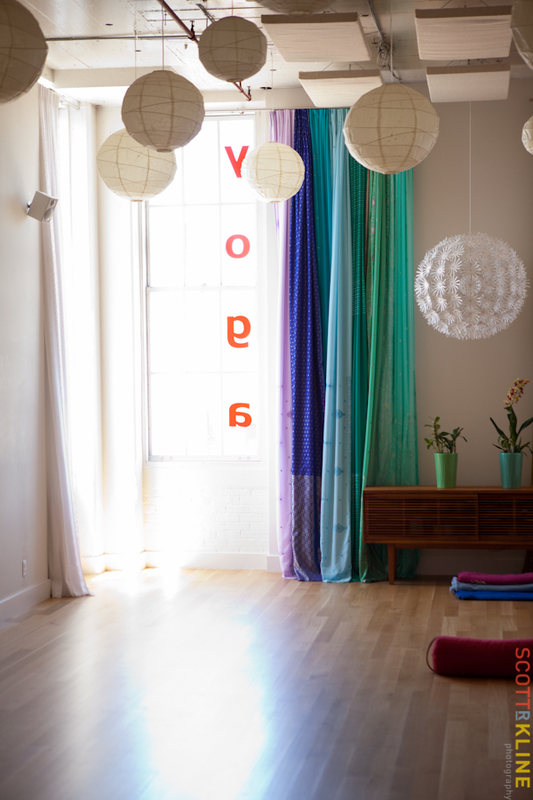 We soon realize that the electric color palette isn't creating the only energy in the room. 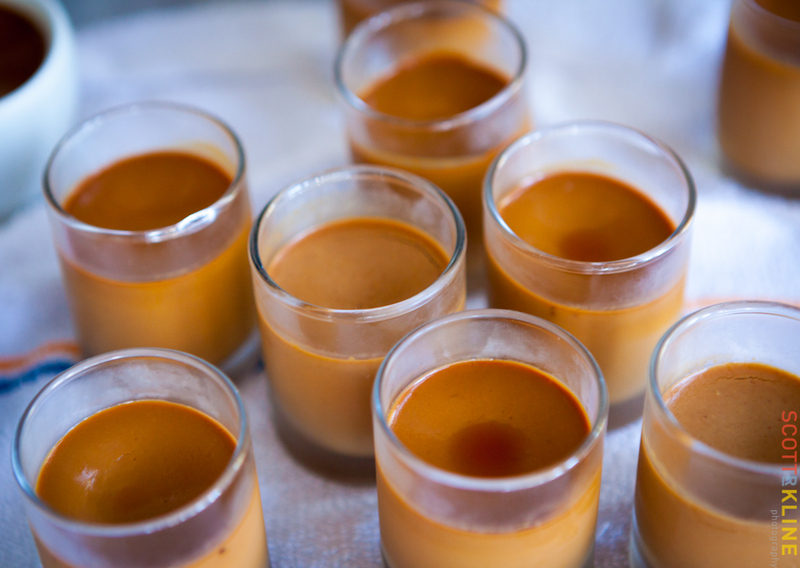 Founded in San Francisco in 1999 as Gourmet Gatherings and later relaunched as Parties that Cook, the company focuses on staging hands-on, interactive culinary events primarily for corporate team building events. 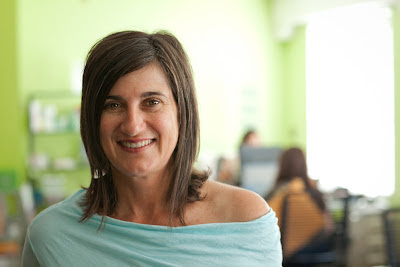 Gilgnilliat has grown her company to include 100 employees and has opened offices in Seattle, Portland and Chicago. Or as Gignilliat likes to say: "4 cities, 12 years, 50,000 Guests, a million memories"! And paying guests are not the only ones to benefit from her success and the talents of Parties that Cook, Gignilliat and her company donate their time and money to more than 50 nonprofit and charitable organizations. I love to bring people together. And I love food and entertainment. Parties that Cook combines all of those interests. In addition, I have a real passion for entrepreneurship. As a Midwesterner, I like to think of myself as a hard-worker or actually as I prefer to say -- scrappy and gritty! I don't mind getting my hands dirty or working hard on a project I believe in. One of my first money-making projects was to collect golf balls off of the local golf course. My friend and I would wash them, put them in an egg carton and resell them to the golfers! We also offered refreshments. Even then I was combining a good money making idea with food! My friend and I made $300 that summer -- not bad for a 10-year-old kid. 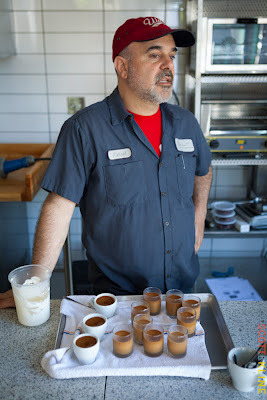 Looking back, I can see how the various positions I held over the years have all had elements of what I love, working with teams of people, marketing, food, which then all came together to become Parties that Cook. I moved to California in 1988 to work as a tour leader for Backroads Travel Company. I soon helped them with their marketing as well as leading tours. A stint in the fashion world with I. Magnin department store followed and I eventually landed at Williams-Sonoma. While at Williams-Sonoma I realized that I was meant to go to cooking school next and I enrolled and graduated from the professional cooking program at Tante Marie, a small cooking school located in San Francisco. It was at Tante Marie that I got my first opportunity to organize and lead corporate cooking events. My first client was a result of this experience. My "composite career", as I like to call it all led to the founding of Parties that Cook. In 2007 we had grown to six employees but we were still working out of my house in San Francisco! We knew we needed to find an office for us and for all of our equipment and supplies but were having a hard time finding just the right spot. We wanted not just a nice office building but also, since we are all women, it was critical that the office be in a safe location. 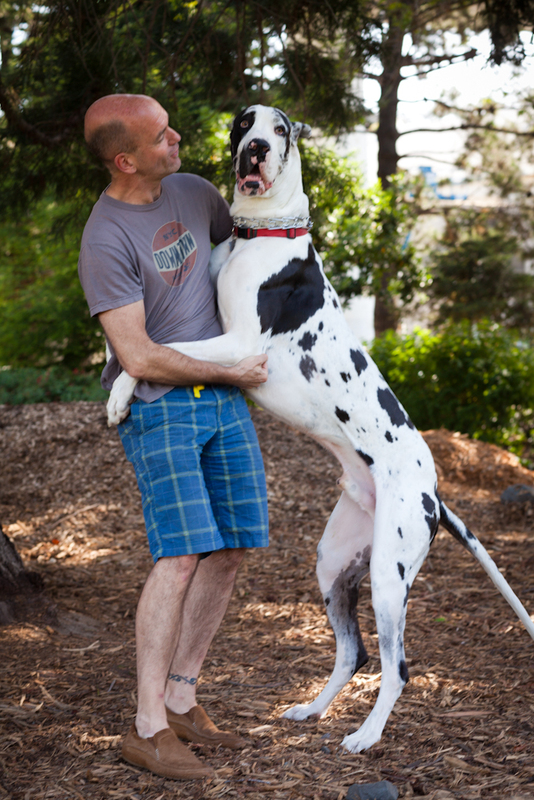 My real estate broker was great but it was actually one of my employees that discovered Dogpatch. The neighborhood was easy to get to, felt safe, had ample parking and great weather. In addition, the building we liked had "good bones" -- I knew we could make it into just the right home for us. I guess it wouldn't be just one person but so many! 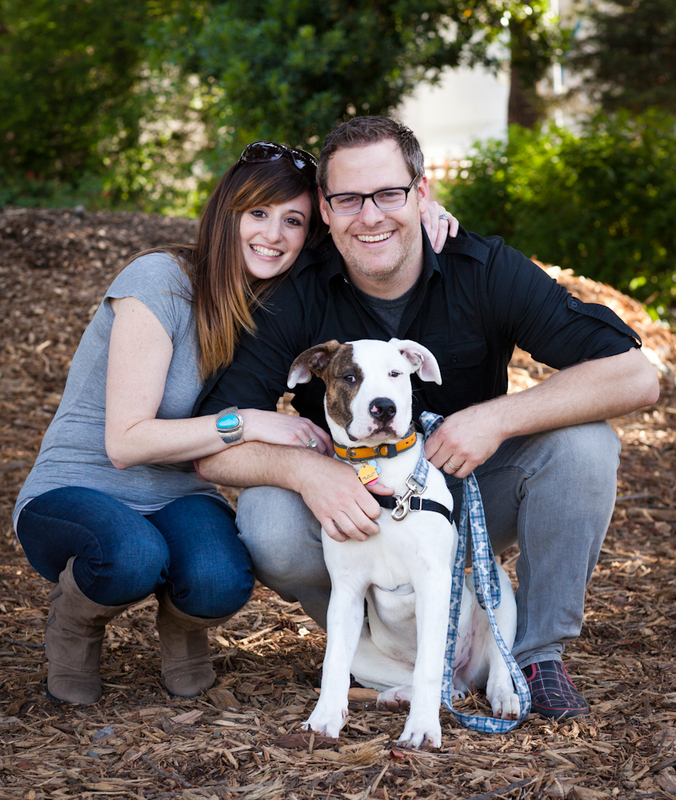 Dogpatch is a place where people like to get things done. I feel like they are scrappy and gritty people like me! 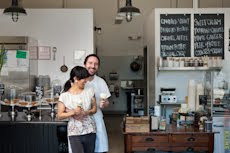 Sher Rogat, one of the owners of Piccino, and Mark Dwight, the founder of Rickshaw Bags, are just two examples. In addition, we have loved teaming with other merchants in Dogpatch to host events or to rent their space for one of our parties. We used to do quite a few events with the Crushpad wine folks but they have since moved to Sonoma. We loved how they were committed to letting everyday people make wine. Dogpatch Wineworks has moved into their old space on Third Street and we hope to do more events with them. We even host a cookbook club that we sometimes invite a Dogpatch neighbor to attend. Well, it isn't really something that has happened to me but one of the things we heard about this neighborhood is that it was Hells Angels territory -- that they had their headquarters here. Being an all woman company that somehow made me feel safer! I love what I do so if I couldn't do this, I would retire and travel around the world!